Most people think that to meditate, you have to sit quietly in a lotus position (legs crossed, the right foot resting on the left thigh) chanting a mantra. When I learned transcendental meditation in the 1980's, that’s exactly what I did, 20 minutes in the morning and 20 minutes in the evening. Sitting like that gave me the feeling that I was in a meditation pose meant exclusively for meditating, and if anyone were to come into the room and see me, it would be rather obvious what I was doing. 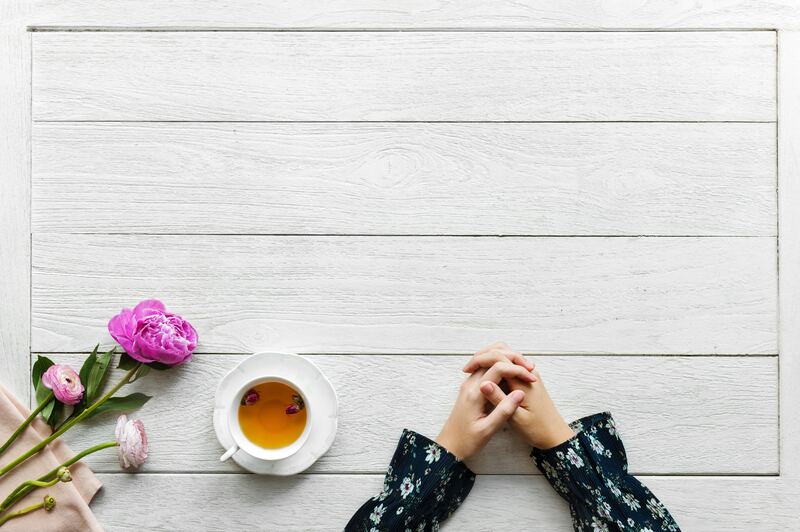 But what I was doing had more to do with what was going on in my mind, than the position I was sitting in — and that, I’ve come to realize, is something you can do in any position, including sitting down drinking your morning cup of tea or coffee. Meditation is designed to quiet your mind and put you in a state of relaxation and peace. By focusing on your breath, your thoughts can come in and out of your mind more easily without attachment to them. This focus and concentration allows for inner transformation to take place, which can take us to a higher level of awareness. When you wake up in the morning be aware of your thoughts. Allow them to come in and out of your mind by observing them. Continue being aware of your thoughts when you do your morning ritual like brushing your teeth, showering and getting dressed. Focus your attention on drinking your tea or coffee. Feel the warmth of your drink on your lips, and going down your throat. Be aware of how it tastes. Feel the pleasure it gives you as you drink. If a thought distracts you from enjoying your tea or coffee, put your focus back on the pleasure it gives you by the taste and feel of it. Be aware of not rushing to finish your tea or coffee. Stay present as you drink what is left of it. Take a moment to hold your finished cup of tea or coffee, feeling the appreciation and gratitude of it as a gift to being alive. Get up from your chair slowly. Put your cup down and begin your day with the mindfulness you feel being in the present. Meditating is something everyone can do. Whether you’re sitting in a lotus position chanting or drinking a cup of tea or coffee, you can put your focus on the here and now by concentrating on what you’re dong with awareness. Practicing a form of meditation will help you go through the day staying in the present and remaining mindful of everything around you. Everything we do is an opportunity to turn it into a meditation by allowing ourselves to be in the present, and focusing on whatever we’re doing with awareness. If you’re someone who would like to meditate, but don’t feel you have time to do it, you can experience it while you’re doing something like drinking tea or coffee, and it will become more than just drinking. It becomes mindful drinking, which takes it to a whole other level. You become aware of yourself drinking your tea or coffee with clarity of mind and a feeling of inner peace. It sure beats drinking a cup of tea or coffee in your car, rushing in traffic, trying to get to where you need to be, your mind racing everywhere other than being in the present. I call that drinking on the go, not drinking in the now.